New York City Mayor Michael Bloomberg today endorsed President Obama, citing the urgent need to address climate change. "The devastation that Hurricane Sandy brought to New York City and much of the Northeast -- in lost lives, lost homes and lost business -- brought the stakes of Tuesday's presidential election into sharp relief," the mayor wrote in the opinion section of his eponymous news operation, Bloomberg News. "Our climate is changing. And while the increase in extreme weather we have experienced in New York City and around the world may or may not be the result of it, the risk that it might be -- given this week's devastation -- should compel all elected leaders to take immediate action." New York City was forced to evacuate neighborhoods twice in just 14 months because of hurricanes, Bloomberg noted. While the city has taken steps toward sustainability, the mayor said cities can't do it alone. "We need leadership from the White House -- and over the past four years, President Barack Obama has taken major steps to reduce our carbon consumption," he wrote, citing the higher fuel efficiency standards the president set, as well as the tighter controls for mercury emissions. An independent known for backing centrist politicians from both the Democratic and Republican parties, Bloomberg for months had declined to endorse a candidate. In an interview with The Atlantic magazine last month, Bloomberg said Mr. Obama's biggest accomplishment in his first term was "just getting elected" because it served as evidence of greater racial unity in the country. 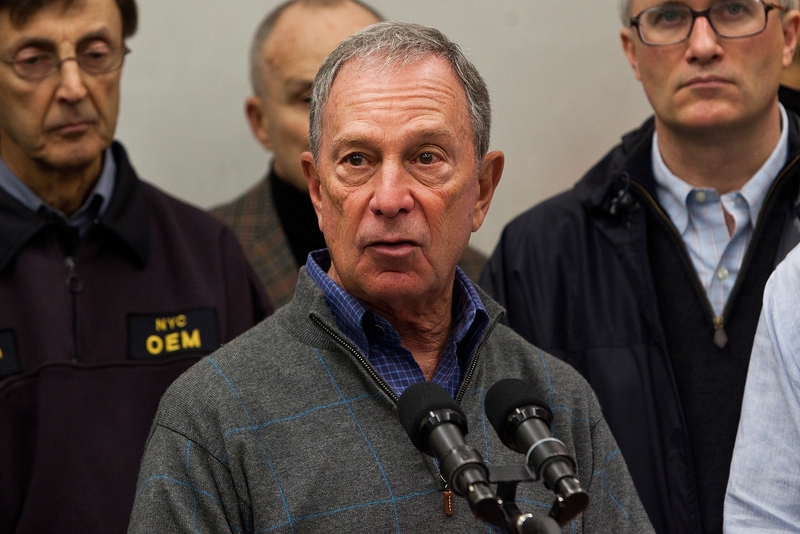 After Sandy left millions without power and crippled New York City's transportation system, Mr. Obama offered to visit the city and assess the storm damage, but Bloomberg turned down the offer. The president instead toured storm damage in New Jersey with Republican Gov. Chris Christie. Climate change has received little attention on the campaign trail, although Mr. Obama often pledges during campaign rallies to keep pursuing clean energy technology, declaring that climate change is "not a hoax." After Hurricane Sandy devastated the Eastern Seaboard, former President Bill Clinton this week railed against Mr. Obama's rival Mitt Romney for opposing Mr. Obama's clean energy policies. Bloomberg noted that Romney signed onto a cap-and-trade plan to reduce carbon emissions as governor of Massachusetts but no longer supports cap-and-trade. "This issue is too important," Bloomberg said. "We need determined leadership at the national level to move the nation and the world forward." Bloomberg also criticized Romney for reversing course on other issues like abortion rights, gun control and health care reform. "If the 1994 or 2003 version of Mitt Romney were running for president, I may well have voted for him because, like so many other independents, I have found the past four years to be, in a word, disappointing," he wrote. The mayor also criticized Mr. Obama for serving more as a partisan populist than a pragmatic centrist in his first term. But he added that there's still hope for Mr. Obama in his second term to work with Republicans. "If he listens to people on both sides of the aisle, and builds the trust of moderates, he can fulfill the hope he inspired four years ago and lead our country toward a better future," he wrote.